All this week I am going over my different programs and what each one was designed for. 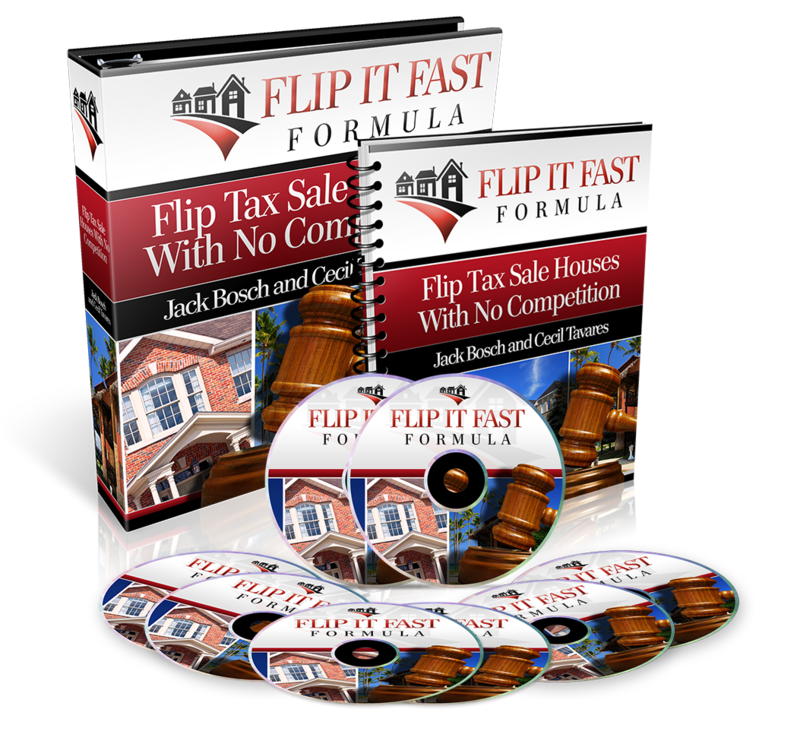 I have already covered the Hidden Tax Sale Cash and Land Profit Generator programs, so today I’ll move on to the Flip it Fast Formula – my latest and greatest creation. 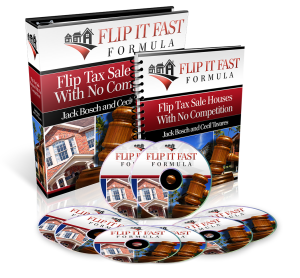 Like the Land Profit Generator shows you how to be a wholesaler of land, the Flip it Fast Formula shows you how to be a wholesaler of houses. But as is always the case with a good investment, you need to make sure that the value is built into the deal. That’s why the FIFF focuses of houses that are tax delinquent and about to be sold at auction. There is a need for urgency when working this program because on the tax sale starts your deal falls apart. Students need to act quickly sending out letters and replying to phone calls if they want to make a profit. You might be wondering why some people are willing to let their houses go at a tax sale? It’s the same situation as tax delinquent land: maybe the land was willed to the owner by a distant great-uncle; maybe the owner bought it to build their dream house with their sweetheart but then the romance went sour; maybe the owner got a high-paying job across the country; or maybe the property was an investment that didn’t pan out. In any of these cases, the owner no longer wants the property and is willing to let the county seize it. As you probably know by now, unwanted real estate equals opportunity. The houses generally aren’t pretty and they often need repairs, but that doesn’t matter because you are looking for a structure that you can wholesale to a rehabber. Once you have a list of houses about to be auctioned, you will need to evaluate them to see which ones have enough profit built-in to make it worth your while. Use this simple formula: Back taxes + Estimated Repairs + Profit for Rehabbers + Your profit = Market Value. And if you find a great deal, I will be happy to partner with you, guaranteeing you a minimum of $10,000 profit PER DEAL! What if you don’t have money to buy the house yourself? How can you evaluate the repair costs even if you don’t have any construction experience? Where can you find a rehabber to flip to? I answer all of those questions in my program, and I hope you check it out soon. Tomorrow I’m going to take a break from explaining my programs so that I can talk a little about listing properties on eBay, then on Friday I’ll talk about my programs for investing in Tax Deeds and Tax Liens.